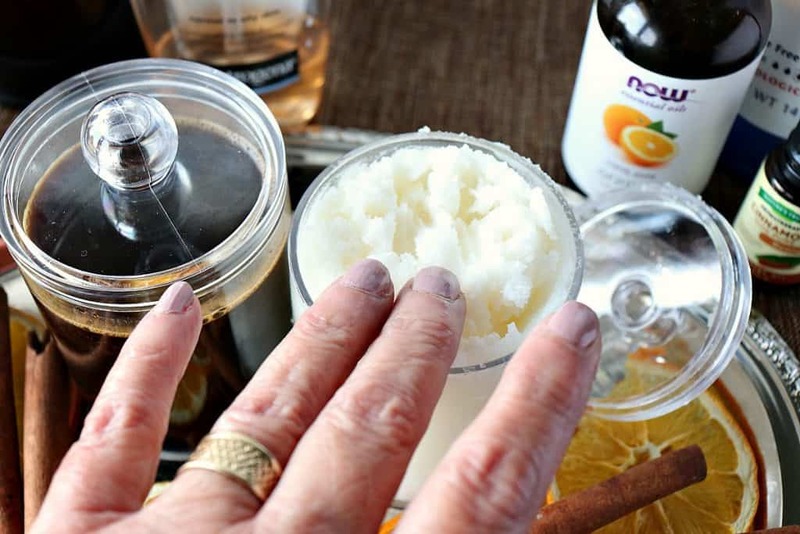 I’ve been using these homemade beauty products for the past several weeks, and I simply adore them. The Coffee Exfloaint is my favorite, but the Coconut Oil Moisturizer comes in a close second! I don’t actually remember the when the lightbulb moment hit to mix my used coffee grounds with my favorite facial cleanser as my daily exfoliant, but since I’ve been using it my skin feels softer, and I believe my pores are less noticeable. The idea for the coconut oil moisturizer came shortly after that. It’s a mix of coconut oil, my favorite moisturizer (to keep the oil from solidifying too much) and some cinnamon and orange essential oils for a lovely and lingering Christmasy fragrance. 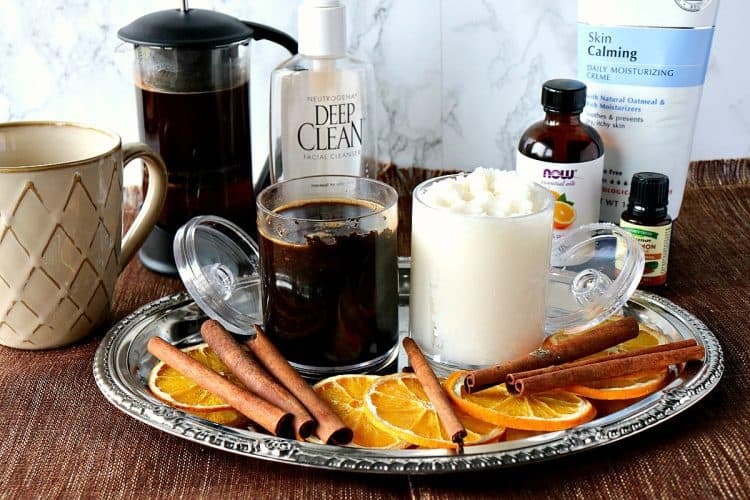 **Note – The instructions (recipe, if you will) for making the Homemade Coffee Exfoliant & Coconut Oil Moisturizer is near the bottom of this post. Collect the coffee grounds in a decorative container for a few days leading up to making the exfoliant. 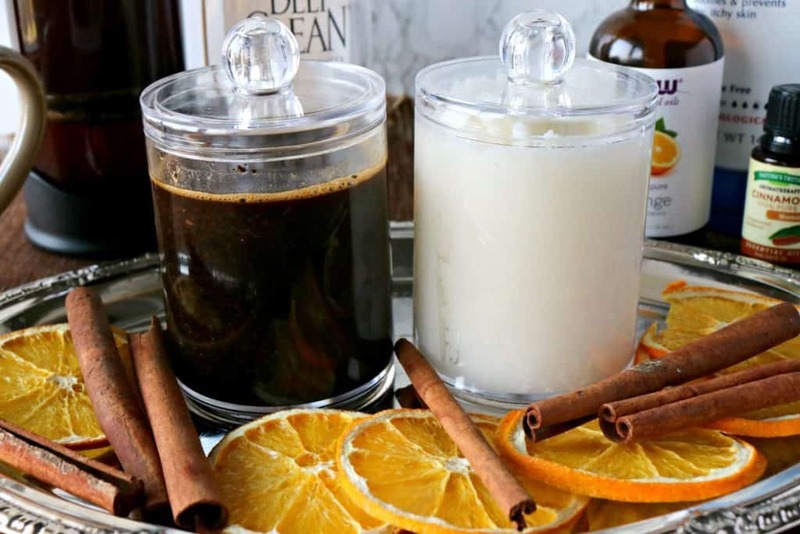 Add some of your favorite facial or body cleanser to the coffee grounds and stir to combine. After 1 hour carefully drain the excess liquid from the top of the jar. Add the lid to the jar and use daily or weekly to exfoliate your face and/or body. Add your favorite brand of coconut oil to a decorative jar with a lid. Microwave on low power until the oil turns into a liquid. Add approximately 2 tablespoons of your favorite body or facial moisturizer. Add a drop of two of orange essential oil and a few drops of cinnamon essential oil (these are optional). Stir well, and continue to stir occasionally while the coconut oil solidifies. Cover, and use sparingly on face, body, lips, fingernails, and cuticles, as needed. 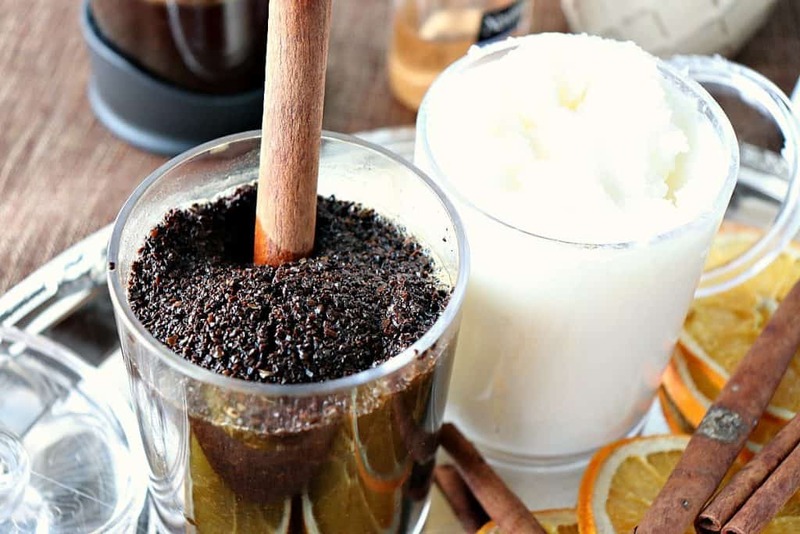 Coffee body scrubs help reduce the appearance of cellulite because the caffeine stimulates dilatation while the scrubbing motion increases circulation and plumps the skin. Coconut oil is naturally antibacterial and antifungal. Coconut oil works wonders as a nighttime hair conditioner as well. Just remember, a little goes a long way. Apply the oil, wrap your hair in a clean towel and wash with a gentle shampoo in the morning. Coconut oil moisturizer also works wonders as a makeup remover. Even on waterproof mascara. **The following affiliate links are some suggested products I’ve chosen that will aid you in the making and storage of today’s homemade beauty products if needed. By clicking on the item photo, you’ll be taken directly to Amazon.com if you’re interested in purchasing any of these products. You are in no way required to do so, and you will not be charged in any way unless you decide to purchase one of these products through Amazon.com. As an Amazon Associate, I earn from qualifying purchases. 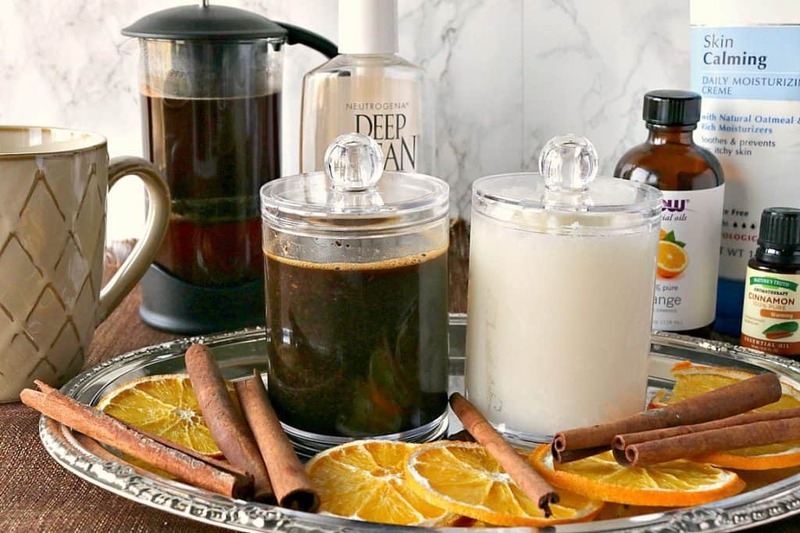 I sincerely hope you’ve enjoyed today’s “recipe” for these homemade beauty products as much as I’ve enjoyed bringing them to you, and as much as I enjoy using them myself! 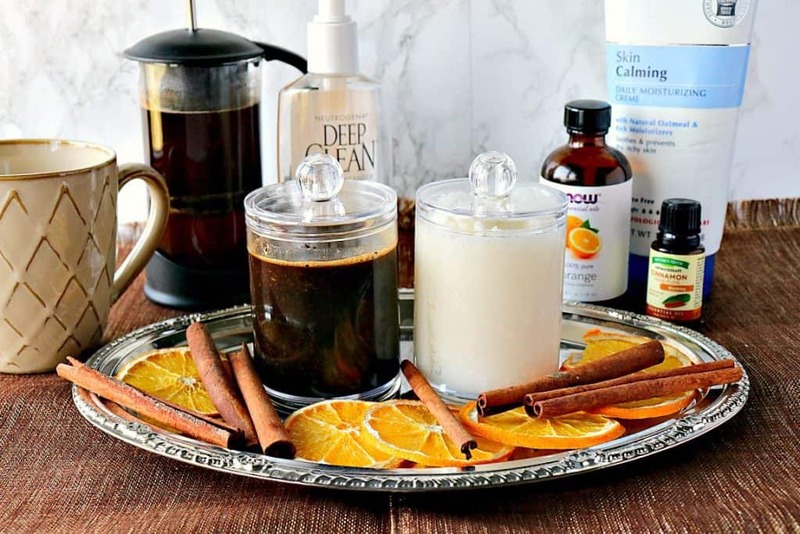 **NOTE – Even though these products; Homemade Coffee Exfoliant, and Homemade Coconut Oil Moisturizer do contain food products, these products are NOT for consumption!! Should you have any questions or comments regarding today’s post or anything else you’ve seen on my site, please don’t hesitate to contact me directly or leave me a comment in the comment section below. It is always my distinct pleasure to get back to you with a reply just as soon as I possibly can! *Note – The post above includes affiliate links. 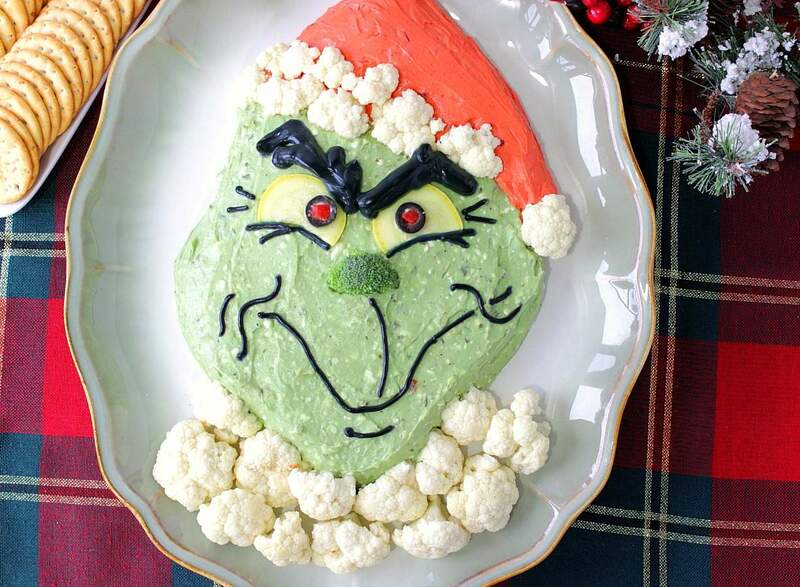 When I find a great product or service, I like to share it with my readers. Sometimes I use affiliate links so I can earn a commission for my recommendations. As always, I thank you for your support!